Now, the reasons I’ve been on the hunt for a camera is for my current and future projects. I will be traveling to many destinations, meeting new people, trying new food, etc., so I had hoped to document my journeys from before, during and after my trips. I have been into electronics since my Dad taught me at a very young age, so it has now become a very addictive hobby. So let’s get to it! After using the Canon PowerShot N for a little under 3 months, the pictures were still stunning but the video playback had a clicking noise. After returning it to Canon, under its warranty, for repairs they claim that they found nothing wrong although the salesman and I agreed the clicking was still there. I love the design of the PowerShot N, it’s unique with a 90 degree angled touchpad making it feel like the old cameras from the early days. The Creative multi-shot option provides 6 different filters and angles which is great for giving a more artistic flair to the photo. Cute concept but I believe that the clicking noise during the video option may be related to the fact that the shutter button is on the actual lens itself and the microphone may be too close to the actual mechanics of the lens. When the camera is charging, all the functionality is locked until it is unplugged from the charger, this can make things inconvenient unless you buy an extra battery. 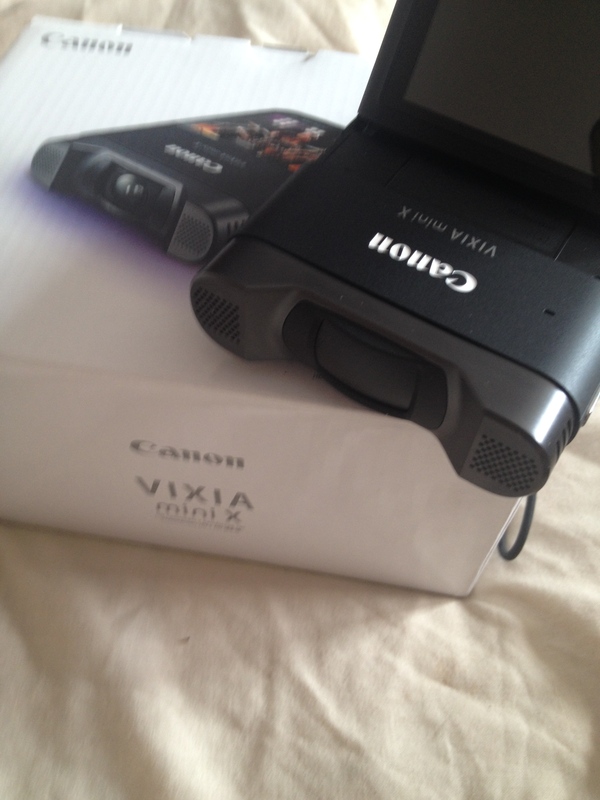 The Canon VIXIA mini X is very easy to use, it is light yet feels like it’s built for on-the-go wear and tear. The lens cover slides over simultaneously with the on-off button and the record and playback buttons are easy to use and find. The “Fish Eye” lens takes some getting used to as I’ve never seen anything like it before, but I love it! It makes the videos look very professional. Another great feature is that you can adjust the sound filtration to match your video environment, for example, if it’s windy out you can choose a preset sound filtration that allows you to cancel out background noises. When plugged in, the camera resumes all its functionality. Although this camera takes still shots as well, I haven’t found anything resembling the Creative multi-shot that the PowerShot N had, but the quality of the pictures is superb! I’m still trying the different features out, but so far it’s turning out to be an excellent camera. Both the cameras range from $299-$399CAD. My advice, if you are a fellow camera lover, is to find a reputable store specializing in cameras. Think of what you want to do with your future camera, be it artistic photography to making movies, do your research and be aware of all your options. I was lucky enough to find a great camera store that offers trade-ins and upgrades to newer equipment and camera models as well as extended warranties.